This is the perfect float for you guys who spearfish in Kelp. 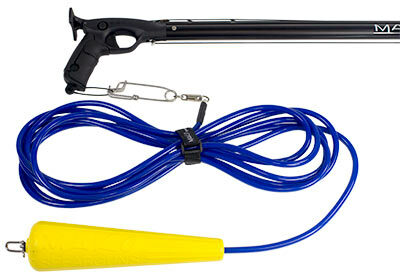 This amazingly durable float with its high vis yellow color, makes you visible to your buddies and boat Captains, and if you ever accidentally drop your speargun or Abalone bar, they can be easily retrieved. These floats are so durable, you can run them over with your truck and not hurt them!! The sleek hydrodynamic design allows the float to slide through the kelp with minimal drag. It easily mounts to professional style float lines such as the MAKO Spearguns vinyl jacketed speargun float lines with a removable longline clip. To install, simply disconnect the D shackle from one end of your float line, remove the longline clip, install the kelp float onto the float line and re-install the D shackle, leaving off the longline clip. The D ring keeps the kelp float in place. I use this as a marker and float when freediving wrecks and it does the job well. Amazingly fast and works great!